Continuing the exploration of jazz clubs via records in my collection, and after checking clubs out on the eastern side of the United States, this post marks our foray into the West Coast scene. Naturally, we start in California, and if we’re in California, naturally we begin in San Francisco. And if we’re in San Francisco, naturally we head to the Blackhawk. And if we’re at the Blackhawk, naturally we have to catch a set by Cal Tjader. This record is a great example of Cal Tjader’s working group in action. 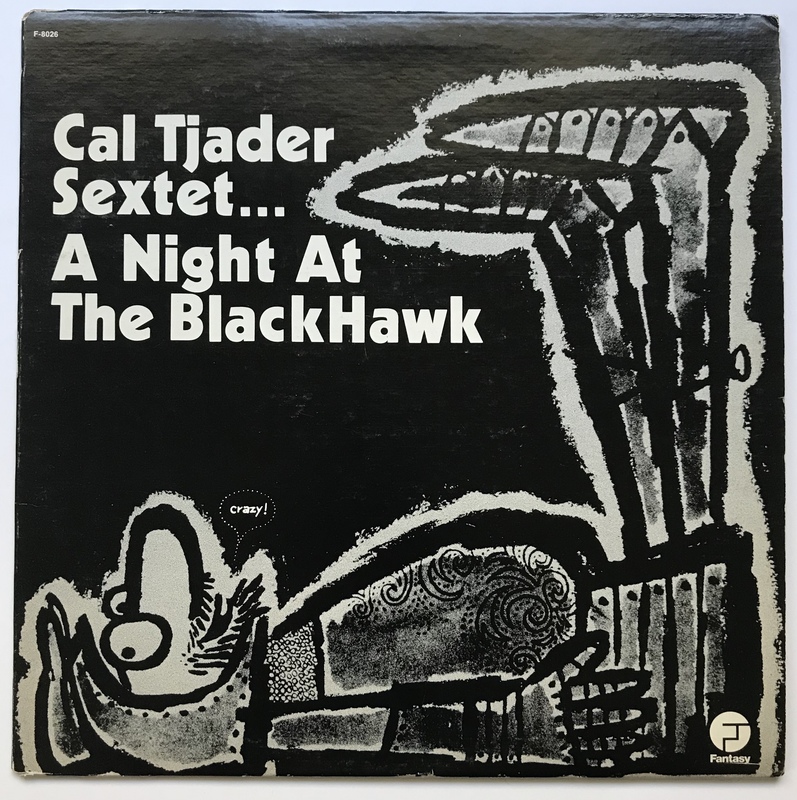 Recorded live in the acoustically-blessed confines of the Blackhawk, the music features Cal Tjader’s usual quintet lineup with the added addition (redundant?) of Cuban tenor saxophonist Jose Silva. The group stretches out on the tunes, playing as much for themselves as for the audience sitting in the club. Picking a track to spotlight from this album was rather difficult, as my two favorite tunes from the album happen to be the longest tunes on the album. “Bill B”, the opener to side two, is a relaxed off-the-cuff blues that meanders for over twelve minutes, giving every soloist the opportunity to blow as long as they want. This track, more than any other on the album, perfectly encapsulates the “liveness” of intimate jazz clubs. From the spontaneous beginning, to the audience laughter and noises, to Cal Tjader’s comments and encouragements, the atmosphere of a jazz club is palpable. Tjader’s shimmering vibes start the proceedings after McKibbon’s bass intro. Tjader’s vibraphone playing always has a cool, refreshing sound, which, combined with his economical approach, made for a rather laid-back, hip style. Someone once called him the West Coast’s answer to Milt Jackson (ok, I was the one who said it). Of course, I like to just accept and enjoy Tjader on his own merits. During Tjader’s solo, Jose Silva weaves his sax in and out of Tjader’s vibes, and steps up to solo after Tjader. I had never heard of Jose Silva outside of his work with Cal Tjader. He appears on three albums with Tjader, all recorded for Fantasy in 1958, and this was one of them. His tenor sounds like a cross between Stan Getz and Tina Brooks, with the husk of Ike Quebec thrown in. It’s both a unique sound and one that sounds familiar. As the liner notes point out, he’s a Cuban playing jazz, and as a result, his ideas are as unique as his sound. He kicks things into double-time as he closes solo, yielding it to Vince Guaraldi’s piano. Vince’s solo continues the double-time pattern, and he digs in for numerous choruses. As he solos, Tjader can be heard telling the group to do “Bill B” and telling Vince to do one more chorus. The drummer slows it back to the original tempo and Vince swings his last chorus harder than his entire solo combined, with Vince throwing some particularly effective block chords that get Tjader’s approval. With another gentle direction from Tjader, the group segues into the cheerful, spare melody to “Bill B”, a Tjader original dedicated to Bill ‘Count’ Basie. “A Night In Tunisia” is in the Latin jazz vein that made Cal Tjader so popular. This performance must’ve come from a different night because the acoustics are slightly different and the piano is slightly sharp. Al McKibbon’s bass again starts things off, with Tjader’s vibes carrying the melody. The percussion team of Willie Bobo and Mongo Santamaria keep things moving with their Afro-Cuban rhythms that must have had the small club rocking. The rest of the album follows this winning Tjader formula of straight-ahead jazz and Latin jazz. It’s solid music from a solid musician. There’s a play on words here. Take a good, long look at the cover, and see if you can figure it out. The original pressing that was released in 1959 had a slightly different cover. On that album, the cover was in color, with a bright pink background a the knight’s armor in a shade of lime green. My copy is an early ’70’s pressing, and they decided to put it in black and white. The cover itself is pretty basic, the appeal lying heavily in the strength of the joke. What’s the joke? Read the title of the album, then look at the artwork. Fantasy Records strikes again. The back of this album is the epitome of everything ‘wrong’ with a Fantasy album. What tracks are on the album? Who knows. You’ll have to actually buy the album and check the album labels to find out. Who are the musicians playing in the group? You’ll have to wade through the liner notes to pick out the names of the guys on the record. Recording date? All we get is “the winter of 1958” and “the Christmas season”, which loosely translates to December of ’58. Fantasy Records strikes again. The liner notes are…conflicting; incomplete; slightly disrespectful. After much ado about all of the sidemen, Vince Guaraldi gets one perfunctory, back-handed sentence. And it doesn’t even acknowledge Guaraldi’s talent on its own merits. Guaraldi left Tjader’s group in 1959 and after a few years became a sensation in his own right, finally receiving the recognition that he was denied earlier in his career. Another issue with the liners is their conflicting spelling of the Blackhawk jazz club. I already went into the controversy surrounding the Blackhawk etimology so I won’t get into all of that again. But, I will point out that it’s called ‘Blackhawk’ in the main liner notes and ‘Black Hawk’ in the smaller liner notes. Fantasy, come on. 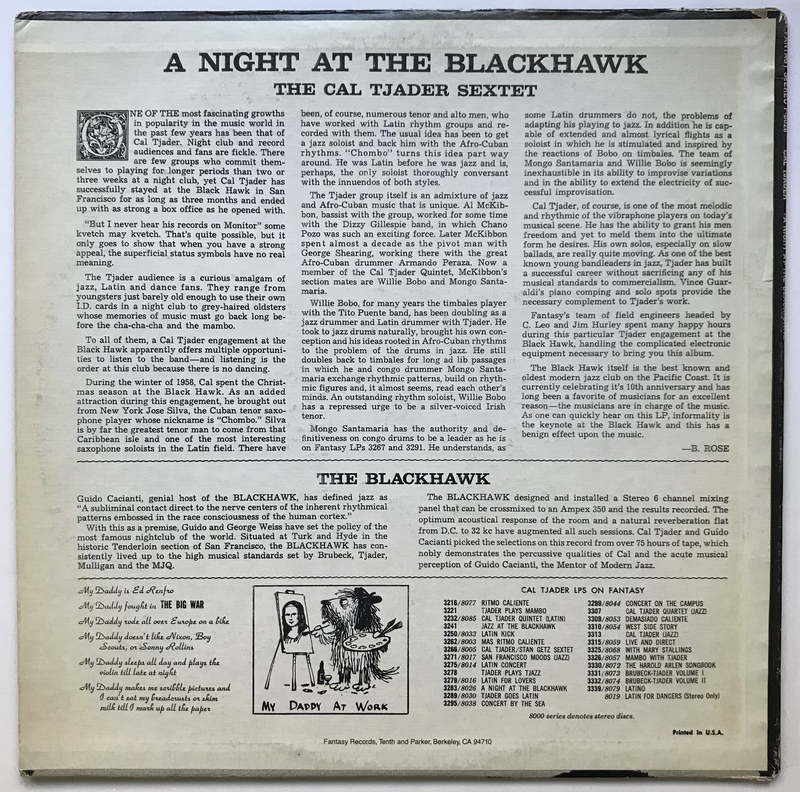 Learning that there was a special recording system installed into the Blackhawk is kinda cool, as is the revelation that there’s what 75 hours of tape that was recorded during Tjader’s stay at the Blackhawk. Where is the rest of the material? Perhaps buried deep in the Fantasy vaults? And then there’s the odd poem with the dog. The only thing I could think of was that it was an involved pun on the RCA dog label. 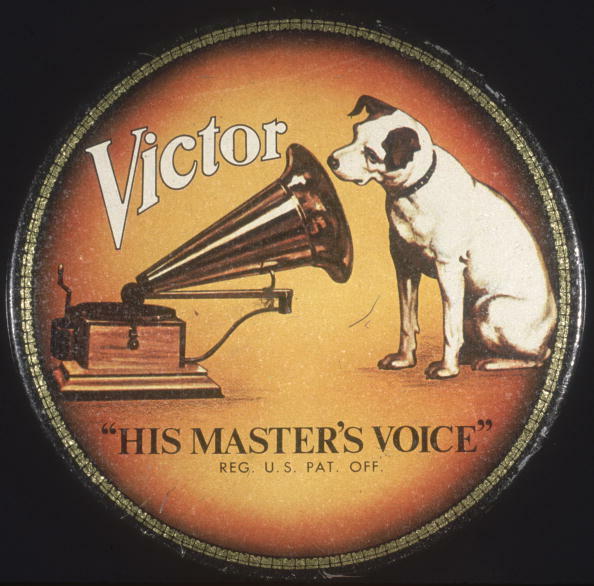 RCA’s label has the famous dog listening to an old gramophone, with the caption “His Master’s Voice”. This dog is at work says “My Daddy At Work”. The first line says that the dad’s name is Ed Renfro. I googled that name, and I groaned. Who was Ed Renfro. An artist from California who, among other things, did artwork for Fantasy Records. Including this album’s artwork. This poem is about him. Fantasy. Strikes. Again. As I mentioned earlier, this is an early 1970’s reissue, and as such it was pressed on regular albeit thin black vinyl, non-deep groove. It plays quietly, in delicious stereo. It would be interesting to compare a first pressing with this later pressing, just to see if the audio mastering is the same. Recordings from the Blackhawk always sound fantastic, whether it’s Miles Davis on Columbia, Shelly Manne on Contemporary, or Ahmad Jamal on Argo. The sound is full-bodied, punchy, and rich. Amen and amen. eBay. This record, as with many early Cal Tjader records, are surprisingly expensive online, as well as in short supply. I had been trying to find an affordable copy, but wasn’t having much luck. When I saw this copy, with its black and white cover and low(ish) price, I jumped at it. It wasn’t until I opened the package a few days later that I found out that it was a later pressing. Maybe one day I will buy an original pressing of the record, but until then, this record will do just fine. Next postHappy Brubeck & Desmond Day!